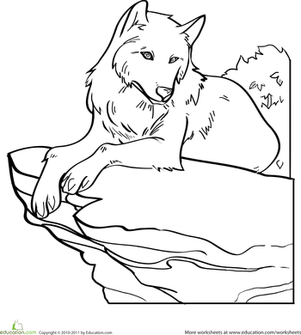 This wolf coloring page features a howling gray wolf and a fun fact about the animal. 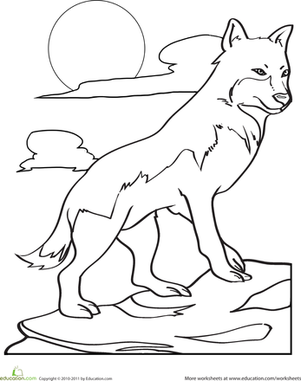 Introduce your child to the beautiful gray wolf with this wolf coloring page. Gray wolves live in the forest and each gray wolf is born both blind and deaf. Do this fun wolf coloring page with your blossoming veterinarian to learn about a new animal. 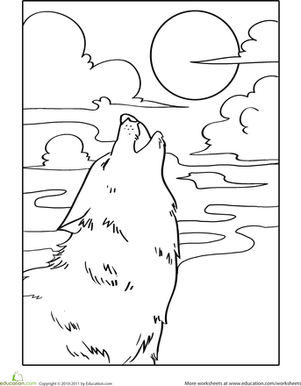 Why is the wolf on this coloring page howling? Kids decide as they colour in this spooky nighttime scene. This coloring page features a fierce wolf who's on the hunt for some dinner. Has your child ever seen a wolf? Here's his chance to take one home with this realistic coloring sheet. Introduce your child to the monitor lizard with a coloring page, complete with a fun fact about this unusual creature. Colour in this cute coloring page featuring the St. Bernard, and read a fun fact about him while you colour! A fairytale coloring sheet of the Big Bad Wolf for preschoolers and kindergarteners. If your child loves reptiles, this is the coloring page for him! He'll get to read a fun fact about iguanas while he colors the picture. Bird lovers, enjoy a fun coloring page all about the barn owl! You and your child can colour in the owl as you read a fun fact.